A new version of Action Solitaire is now available. Version 0.91 fixes some bugs from version 0.90 and adds a new game - Double Pyramid. Action Solitaire is a collection of 23 solitaire games that are played in a new way. Unlike regular solitaire, Action Solitaire is played for points against the clock in timed rounds. Action Solitaire is a whole lot of fun. I highly recommend giving it a try, it is different from Pretty Good Solitaire but very addicting. Action Solitaire has quick, easy games like Pyramid, Triple Towers, and Fourteen Out, but also adds challenges to solitaire classics like FreeCell, Spider, and Klondike. Fan type games are one of the classic groups of solitaire games. 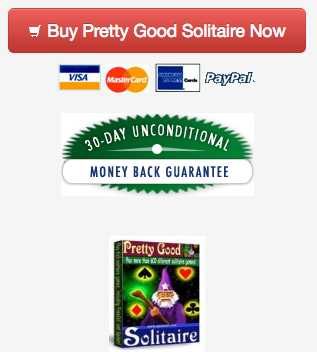 In Pretty Good Solitaire, there are currently 28 different solitaire games of this type. The basic game of the type is the game Fan. It gets its name because the deck is dealt out in fans of three cards each. Most of the games of the type feature fans of three or perhaps four cards, usually with all of the cards dealt face up and only the top card of each fan available for play. In Fan, the objective is to build four foundations piles up in suit from Ace to Kings. In the fans building is down by suit, one card moved at a time. The primary problem you are faced with when playing Fan is a lower ranked card buried beneath a higher ranked card of the same suit. This situation will block you from winning unless you can play the higher ranked card somewhere else in order to access the lower card. While Fan is a good game, other games of its type are more popular. The two most popular fan type games are La Belle Lucie and Three Shuffles and a Draw. In both of these games, shuffles are added to aid in unblocking cards. When play comes to a standstill, you can click on the empty stock pile to reshuffle the fans. All the cards in the fans are picked up, shuffled, and dealt back out three cards to a fan. In Three Shuffles and a Draw, after the third shuffle (second redeal), you can draw any buried card out of a fan and move it to the top of a fan. This makes the game even easier by letting you get rid of a block. Our new Action Solitaire game features two fan type games adapted to its action round format. Fast Fan is the action version of La Belle Lucie. The cards are dealt out in fans of three cards as in most fan games. Your objective is still to build four foundation piles up from Ace to King, but in Action Solitaire's Fast Fan you want to score as many points as possible. You get 500 points for moving each card to the foundations, 2000 more points for completing a 13 card suit on the foundations, and 10000 more points for moving all the cards to the foundations. Plus you must complete the round before your time bonus points run out. In Fast Fan, there are unlimited redeals, but you lose points for each redeal. The first redeal costs you 1000 points, the second 2000 points, and so on. You can always complete the foundations in Fast Fan if you use enough redeals (and if you have enough time), but the redeals will get costly in terms of points if you use too many. Another fan type game in Action Solitaire is Free Fan. Free Fan is just like Fast Fan, but adds two free cells. You can store any one card in each cell. Because each fan has three cards, by having two cells you can use the cells (assuming they are both empty) to access any buried card in any fan. This means that in Free Fan you do not need to rely on costly redeals to retrieve blocked cards buried in a fan. As long as you are able to keep your cells available, you can free all the blocked cards. Fans of La Belle Lucie, Three Shuffles and a Draw, and even FreeCell will find the new Free Fan a very interesting game. The cells add opportunities for the skillful player to deal with any difficult position. I highly recommend all fan type game players to give Free Fan a try. 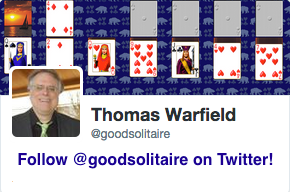 Fan, La Belle Lucie, and Three Shuffles and a Draw are among the 560 solitaire card games in Pretty Good Solitaire, which can be downloaded from <http://www.goodsol.com/download.html>. Fast Fan and Free Fan are among the 23 solitaire card games in Action Solitaire, which can be downloaded from <http://www.actionsol.com/download.html>.